FOUR people were rescued by firefighters after a blaze broke out in a flat in the Leith area of Edinburgh. Crews were alerted to the fire at around 12.20am this morning. The fire had started in the bedroom of an unoccupied second floor flat in North Junction Street. Lothian and Borders Fire and Rescue Service said they rescued a 19-year-old man and 16-year-old girl from another property on the same floor. Meanwhile, control room staff gave fire survival guidance to two people in the flat above the property on fire. They were said to have provided reassurance to the pair until firefighters rescued them, carrying out the 32-year-old woman and walking the 33-year-old man down the staircase to safety. Both people were checked over by ambulance crews before being taken to Edinburgh Royal Infirmary for treatment for smoke inhalation. 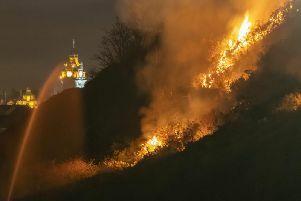 The fire service said around 20 firefighters, using three fire engines and one height appliance, were involved in the rescue and the effort to extinguish the blaze. A Red Cross vehicle attended the scene to help those residents who had to leave their homes temporarily because of the fire.